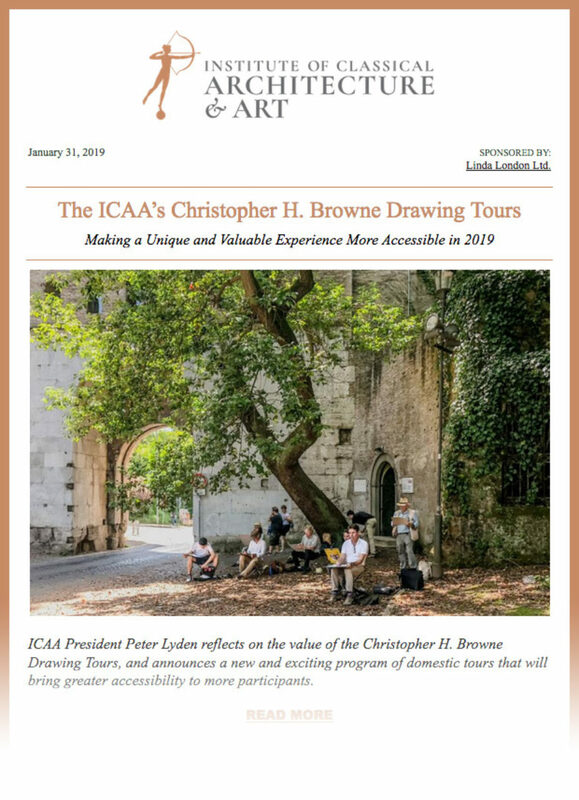 Read the latest ICAA newsletter here. Published January 31, 2019, it features ICAA President Peter Lyden's announcement of new Christopher H. Browne Drawing Tours, Mark Ferguson Award-winner Corey Ringle's recollections of the Winter Intensive in Classical Architecture, ICAA Board Member Jared Goss's roundup of top American museums for the enthusiast of classicism and the traditional arts, the announcement of the 2019 Peter Pennoyer Cast Hall Fellowship, information on upcoming Continuing Education programs, upcoming travel opportunities, and more. The ICAA is also pleased to provide an archive of past newsletters and other digitized periodicals within the new Resources section of classicist.org. Visit the Periodicals Archive here.